Creating a competitive future for Morocco’s fishermen – Millenium Challenge Corp.
Millennium Challenge Corporation/MCC, by Scott Fontaine (June 14, 2013) — The life of a Moroccan fisherman can be tough. A boat packed with three or four men will launch well before sunrise. The fishermen occasionally need to stay on the ocean for two or three days until they fill their stores. Bad weather can shorten or cancel trips. When they return, they can face difficulty selling the catch at the peak of freshness or at the right price. Predatory middlemen often collude to keep prices low. The lifestyle provides erratic income. 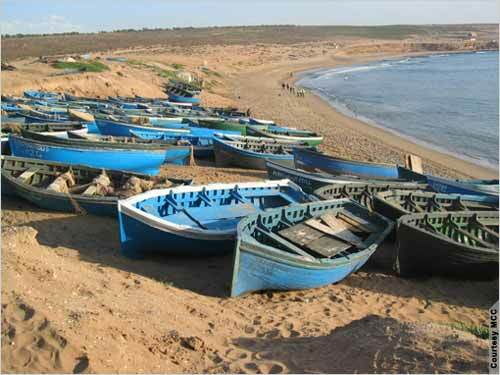 Fishermen tend to be among the poorest Moroccans yet live on the coasts, where the cost of living is high without much of a safety net. But across the Atlantic and Mediterranean coasts, improved landing sites stand as a symbol of hope for many of the country’s small-scale fishers. 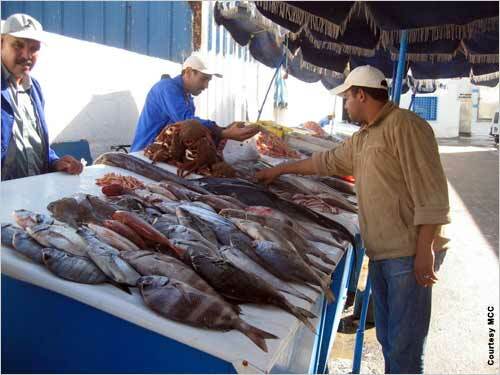 Refrigerated market & transport facilities boost Morocco fishing industry. 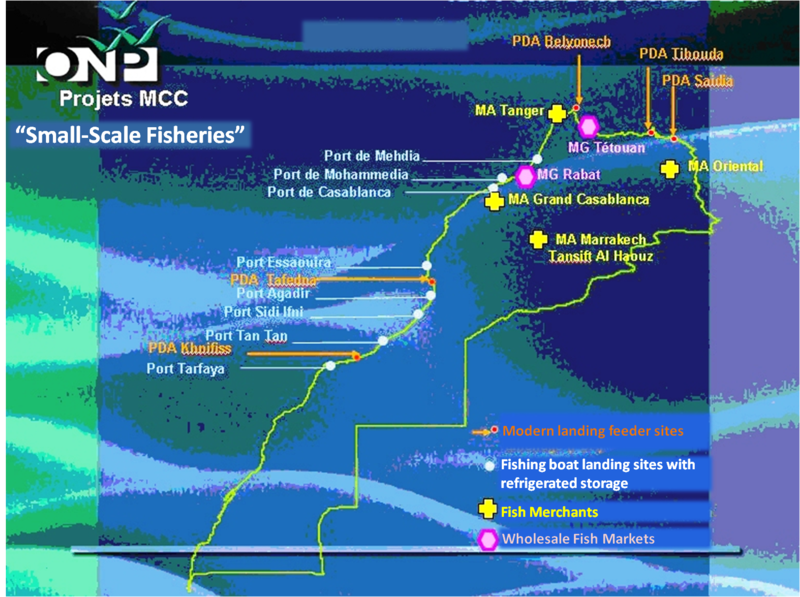 Eleven improved landing sites are being built or operating as part of MCC’s $120 million Small-Scale Fisheries Project. The sites are gleaming white complexes built on the beach; a typical site contains an auction hall where fishermen can sell directly to distributors, storage units for equipment, a watch tower in case of a waterborne accident, a cafeteria to help fund the newly formed fishing cooperatives, and cold storage units to ensure the catch doesn’t spoil before reaching the marketplace. About 78,000 people are expected to benefit from the landing sites. Along the Atlantic coast, fishermen in three towns where the sites have not yet opened are optimistic about the future. In Salé, Samir Wakrim is most hopeful about the fishermen’s association being formed through the project and the medical insurance it will provide. The 33-year old has been fishing for more than two decades but can’t afford to miss work because of illness or injury. A few years ago, he slid down some concrete steps and hurt his leg. Every day he spent recovering at home meant less and less income. In Bhibeh, a fishermen’s cooperative has already formed and includes more than 115 members. 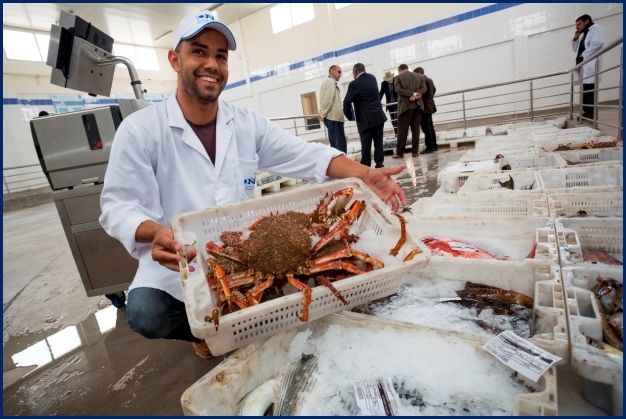 For Khalid Lamziouk, days of hard work at sea can lead to despair when buyers aren’t available to purchase the catch. The fishermen face a difficult choice: Wait for buyers to show up and risk spoilage, or pay for ice and transportation to sell the catch at a nearby town. With the auction hall and cold storage, Lamziouk believes he can sell more of his fish and save the money he would have spent on ice and transportation costs. “This is the right equipment at the right time,” he said. In Tafedna, the prospect of an auction hall where fishermen can sell directly to distributors holds the greatest promise. Currently, middlemen will often advance money for gas and nets to crews of fishermen who agree to sell their catch exclusively to the middlemen at a fixed price. “It creates a dependency this way,” cooperative president Mohamed Dibe said. The fishermen in Tafedna have other problems, he said. Because of the town’s remote location, the few buyers collude to keep prices low, Dibe said. Some fishermen have chosen to leave Tafedna to work out of a neighboring, larger market, where there are more buyers and prices can be 50 percent higher. Dibe is optimistic the auction hall will help fix that.